For Magic Mondays this week we a magical sword that can cut through anything. This week we show you the Wind Shear array. Notation: Create a Containment Field as wide across as the array and 100 times as long that excludes Animals, Wood, Stone, Iron and Light if these materials are present. Description: Not as clumsy as a musket. An elegant weapon of a more civilised age. The Wind Shear array is more than just an array, in fact it cannot even function properly as just an array, it is a tool and a weapon, it is an extension of the body put to beautiful if lethal purpose. The Wind Shear is an array put on the top of a sword hilt instead of a blade and the rest is easily imagined. This ephemeral sword can cut through nearly everything and absolutely nothing can stop it, not even another wind shear sword, for there is really nothing to stop other than a containment field and no containment field can stop another. The array as shown above is incomplete. In order to be an effective sword, this one must be able to be “sheathed” and such it can’t be “on” all the time or you might cut your own leg off by mistake. 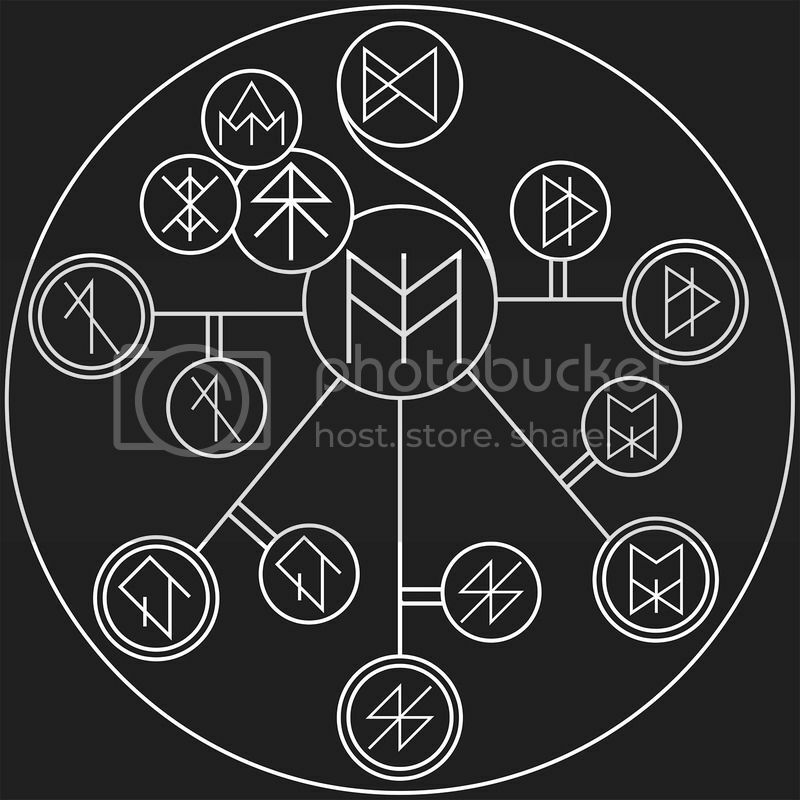 As such the Create rune and affect line requires an additional If-Then statement that can act as a switch (most often a physical one on the sword) through which you can turn on or off the containment field. Whatever material and rune you use to trigger the “on switch”, remember that you can’t then use that as a material that this array destroys. There are only five materials that this array destroys, but this is merely for ease of viewing. True Wind Shears are easily adaptable to the environment and to the skill of the person drawing it and so you can add as many materials as you want in there. Some Wind Shears have thirty or forty materials that it destroys, ensuring that it covers all its bases. Just remember to keep the Light rune in there as it serves two purposes. Firstly, it acts a guide for where the “blade” of this sword is, so you don’t under- or overestimate its length and cut off something of yourself that you’d rather not part with. Secondly, a midnight black blade that can cut through anything and can appear from thin air is as useful a negotiation tactic as the stoutest cannon. Many a man has backed down from a fight when a wind shear sword has been turned on, knowing what comes next. Want to create your own runic arrays? Well it’s never been as easy as it is now with the new Rune Cards, a deck of 85 cards designed especially for runic array creation. Simply click on the banner above and enjoy. Good spotting! Thanks for telling us. That’s what I get for using the last week’s array as a template! Previous Previous post: Rune Cards!